When I studied the different religions in college, I cried from the beauty of what I read. Each one beautiful in its teachings of piety, peace and understanding. The Olympic Games are held every 4 years to bring together athletes from all around the world to compete under the name of global harmony. And yet, hundreds of thousands fight and die 'for God' and others refuse to admit defeat for games now completed. By the time you finish reading this, hundreds will lose their lives and a certain Western nation continues to think it is the Earth's greatest country. Time to wake up my friend. Here in KL, we wonder what the future holds for us. A developing nation with ridiculous front page news. A once-condemned politician has officially returned to Parliament. 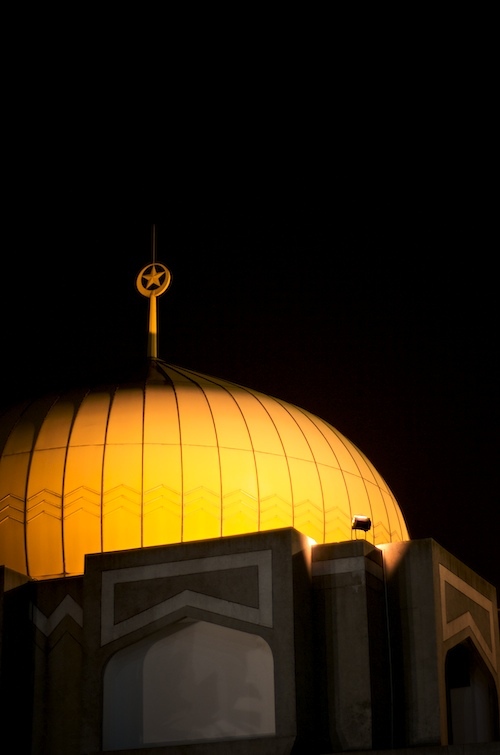 This is a picture of an onion dome of one of KL's more popular mosques. Beautiful, isn't it? I still cry as I continue my study of religions but my tears fall harder when the beauty is twisted and abused. That is a super photo. What you say sums up the world in a nutshell. Its a sad state of affairs. Let my tears join yours. I could never understand why people fight and kill in the name of their God/s who are supposed to be kind, loving and merciful. I think that I never will. On a more positive note though, I think that your photograph is beautiful!